Amstetten in early spring is a town of beautiful flowering trees, unnaturally green grass and unnaturally blue sky. Amstetten in summer is a plain boring provincial town with a serious lack of pavements. Rather similarly, Distelberger’s Brettljause is a younger retarded sibling of its superb Mostbaron Teller. Everything that made the Mostbaron Teller special is missing here, making it a very standard offering. To be fair, it is not bad. 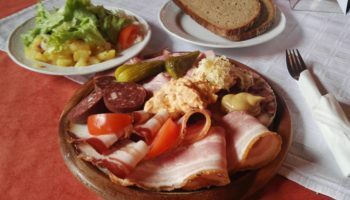 It still features that salty dry meat that made the Mostbaron unique, and the Schweinsbraten and the Geselchtes are more than acceptable. Unfortunately, the blood sausage, as expected, did not add anything to the experience, and the Speck was served cut into such tiny pieces that its taste was impossible to appreciate (those wishing to experience the taste are advised to try the Mostviertler Teller, at the expense of getting a very tasteless fresh sheep cheese as a side dish). 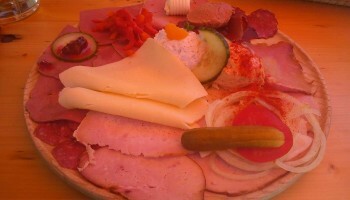 The plate also contained some cheese and a Liptauer spread which were distinctly average even by Vienna standards. 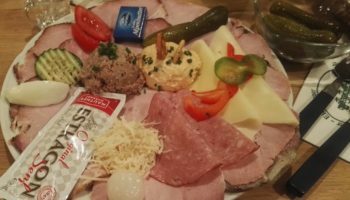 Finally, the Brettljause contained half of a cold meat dumpling (Fleischknödel), a sort of a minced meat thingy in a potato crust. 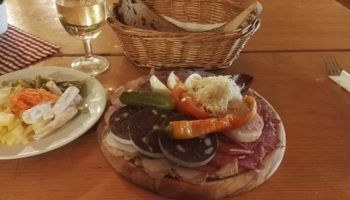 Except for the surprise factor it hardly added anything to the overall taste and, like the blood sausage, was only enjoyable thanks to the strange home-made pear mustard and the horseradish. 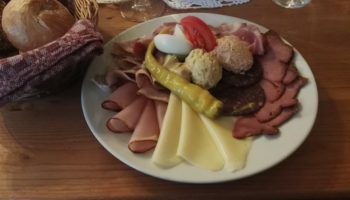 Distelberger is a great place deservingly awarded with all the awards there are, but I could not help feeling that the Brettljause was simply a cheaper and poorer version of their truly special Mostbaron plate. Taste-wise it does not win over the Brettljausen in the surrounding area, though Distelberger easily beats the competition in terms of the Most quality and variety. Update from 19.4.2015. Not much has changed Brettljause-wise compared to almost three years ago (except my phone camera’s quality), but today – perhaps thanks to the nice spring weather – the Brettljause has left a better than average impression, especially the Schweinsbraten. The pear mustard remains very good, though maybe too sweet. 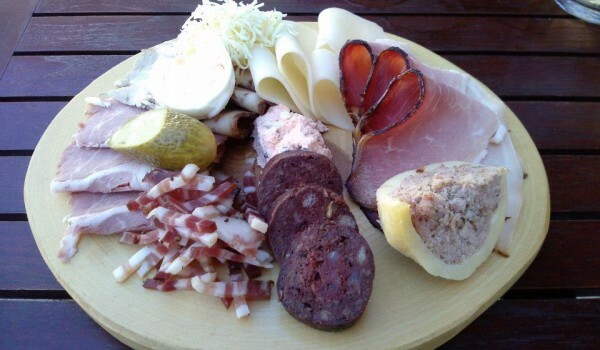 They also have a strong apple mustard – to be tried next time, probably with a thick piece of Braten to accompany it. 6 out of 10 sounds a fairer score now.